“An all electric version could have an even bigger impact on London’s air quality. 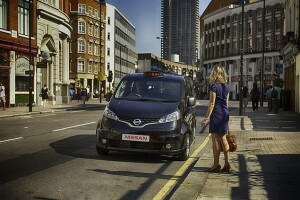 Having been the first car manufacturer to mass produce a 100% electric family car with its trail-blazing Nissan LEAF, Nissan could cement its place at the forefront of motoring technology with the introduction of an all-electric e-NV200 London Taxi. With running costs estimated to be around one fifth of a conventional, diesel-powered Hackney Carriage it is likely to be popular with drivers too”, according to the Nissan press release. London have already tried to reduce traffic, and the pollution that comes with it, by adding congestion charges to the inner parts of London, but these messures are just not enough. Making vehicles used in the Capital more efficient and with less produced CO2 emissions, seems to be a better and cleaner way to move forward. At the end of last years Transport for London announced plans to introduce hybrid double-decker buses in the city. Replacing taxis in London with a more environmental friendly alternative seems to be the next natural step forward. London Assembly members have already voiced their concerned regarding the current slow rate of installing charging points for electric vehicles, it’s therefore critical that the politicians step up their game for this new en-devour to succeed. If a majority of the cabs in London get replaced with more environmental versions, and possibly even all electrical models in the future, so does the pressure build for the infrastructure to change with the times. This could lead to a positive spiral where more charging points for electric vehicles are installed, and therefore also the demand for electrical vehicles increase within the cities population. It could of course also fall flat if the infrastructure and build rate stay the same as today. Taxi versions of the NV200 have already been unveiled in Tokyo and it has also been chosen as the exclusive New York City ‘Taxi of tomorrow’.